I met the man, the brand, who allegedly has the power to change this generation*! He never claims as much, as he seems to bask in the aphorism. I walked into his talk show, which claimed I would be pepped up. 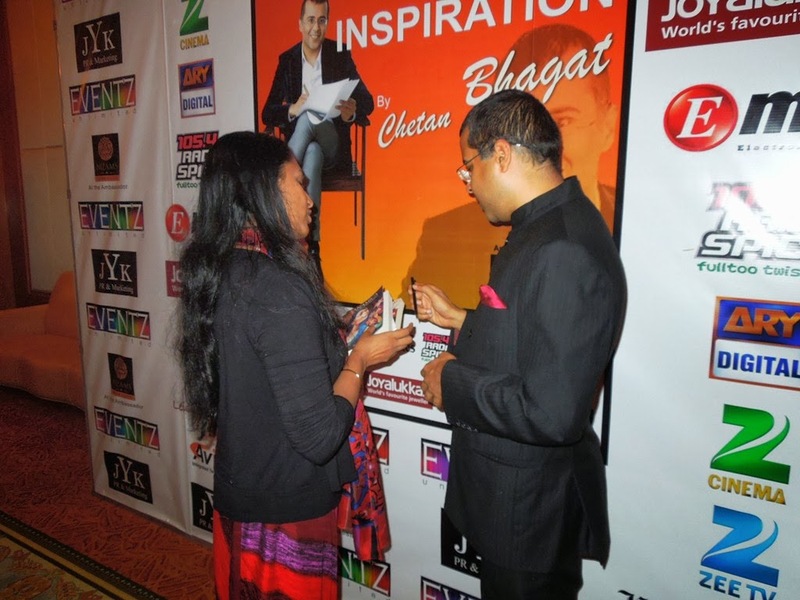 ‘An inspirational evening with Chetan Bhagat’, that’s what it was titled. So I looked for anything that lifted the throbbing wobbly parts of myself no sooner I stepped into the extravagant Ritz Carlton. A chilled drink did the best it could and a friendly hostess did some more to pacify the vengeful sinus-vertigo aliens unhappy with me not pampering them. Soon, the man with about 2.3 million Twitter followers and 4.2 million FB fans walked in escorted by two women. Having goals is crucial to living life, he continued. When he became a full-time writer his first goal was to challenge publishers who rejected his manuscripts. And thus he began urging NRIs to challenge themselves. “NRIs only exist…they lack the zing in them..” With annually increasing bank balances, bigger homes and sending kids go to the best institutions, NRIs “pull on” and “go on”. He called on all to chase their dreams. That’s when I heard him say his dream was to be a househusband. Some laughs, muffled and modest followed when he delivered the age-old mom-in-law and wife jibes. He went on to recommend how important it is to ‘under-promise and over-deliver’, and gave the example of his upcoming movie ‘2 States’ – based on his autobiographical book by the same name. “Form partnerships, cultivate patience, be humble…” were his tips for success. His political allegiance to BJP and reasons for him thrashing the fledgling AAP was also clarified in the process. By now I was slouched in my chair! The trials and tribulations during his incubation period, the brick bats he battled; his mental, emotional state when overcoming them; his modus operandi…is what the audience would have taken home and adopted and remembered when they feel low and seek to get out of the mundane rut. A connect lies in the ears of the audience, as with the heart of the speaker… provided there are no expectations! There I go… so what did I expect? To see a brand named Chetan Bhagat. And I only saw a human in flesh!